Click to enlarge and check your answers! Then click the Back key to return to the original photo. Click on the photo to enlarge. Identify the numbered structures. Then click the back key to return the original photo. Then click on the link to see the answers. Click on the image to enlarge and identify the structure at each number. The retina is composed of pigment epithelial cells, photoreceptor cells, retinal support cells and nerve cells that are organized into simple but distinct layers starting with photoreceptors and moving inward to the layer that includes modulating interneurons, and synapsing finally on optic nerve cells (the ganglion cells). The vernacular divides this simplicity into a complex anatomic appearance. 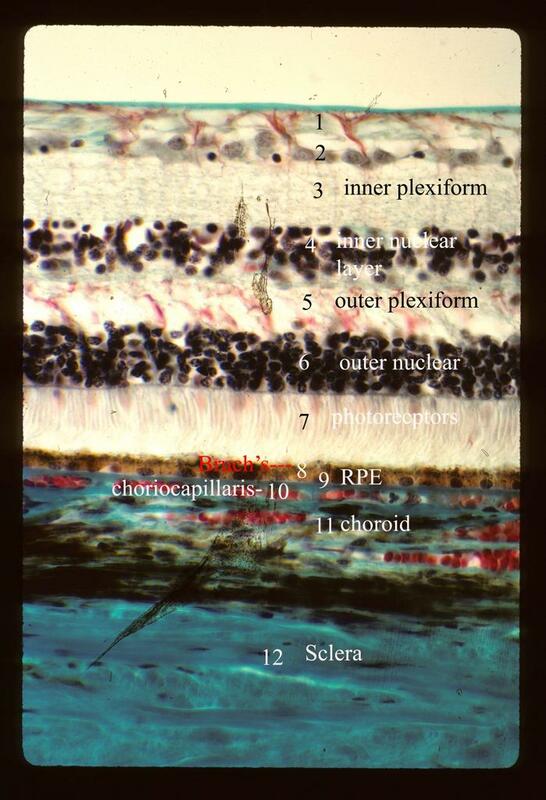 Click to enlarge the photomicrograph to the left. Internal li miting lamina, basement membrane at the interface between the vitreous and the retina. 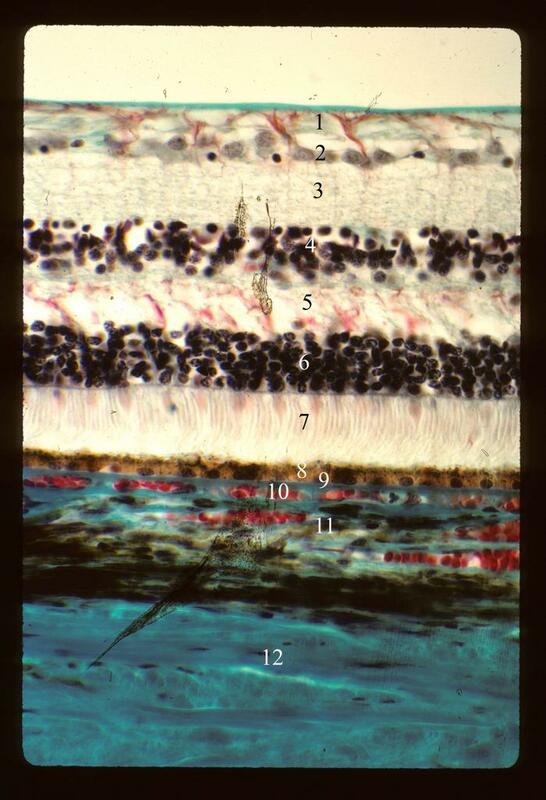 Retinal pigment epithelium (9 (RPE)) sits immediately on Bruch's membrane (8). Above the RPE or on the inner or internal side lies the photoreceptor layer of the retina that has the rods and cones. The RPE are supportive cells and have macrophage function. The photoreceptors called rods are about 2 µm thick and average of 50 µm in length, possessing a roughly cylindrical outer segment. Cones are shorter and thicker, 3-5 µm thick x 40 µm long; their outer segment is conical in shape. 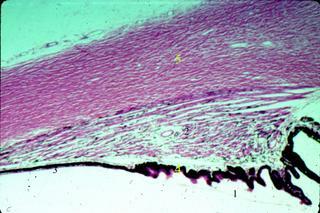 The tips of these rods and cones are embedded in the microvilli of RPE, which phagocytose the old photoreceptor disks. Cones, perceive color, are concentrated in the macula and particularly the fovea. Rods, which perceive light intensity but not color, are concentrated at the periphery of the retina. The light- sensitive photoreceptor disks in the photoreceptor cell form huge stacks 600-1000 deep in the outer segment of the cell and originate as deep infolds of the cell membrane. Muller’s cells and astrocytes also called microglia are supporting cells. Muller’s cells extend from the base of the inner segment of the photoreceptor cells, where they link to each other by adherent junctions to form the structure known as the outer limiting membrane, to the retinal surface, where they rest on the internal limiting membrane. Microglia, astrocytes, act as support cells to the nerve cells throughout the retina and are characterized by long dendritic processes that form a scaffold for the delicate processes of nerve cells. Interneurons integrate signals from photoreceptors and include bipolar cells, ganglion cells, horizontal cells, amacrine cells and interplexiform cells. The terminal of a horizontal cell is interposed between the photoreceptor and the bipolar cell to form a structure termed a triad. The horizontal cell can therefore modulate the impulse from the photoreceptors to the bipolar cells and allows integration of signals from adjacent photoreceptors. Bipolar cells connect with the synaptic end of the photoreceptor cells to transmit signals to ganglion cells. Horizontal cells, amacrine cells, and interplexiform cells modulate the impulses from the photoreceptors to the ganglion cells. Their processes interpose the connections between bipolar cells and photoreceptors, and between bipolar cells and ganglion cells. Specialized regions include the macula lutea which is a small yellow area located lateral (temporal) to the optic disk. The macula is defined anatomically as having multiple ganglion cell layers. At its center the fovea is a thin zone of retina composed exclusively of cones. 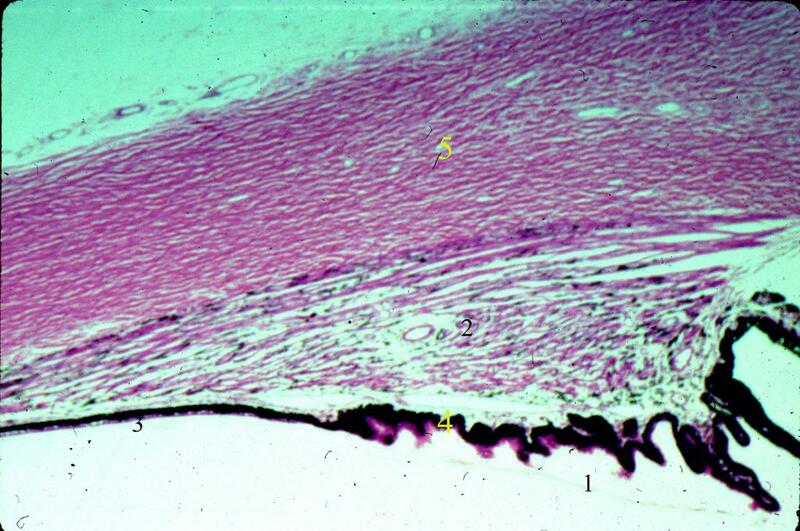 There are no ganglion cells directly overlying the cones, they are displaced laterally. One cone synapses with one bipolar cell which links to one ganglion cell. These anatomic features enhance resolution, provide color vision and make the fovea the center of vision. In the peripheral retina photoreceptors are triggered by movement and some by bright light. 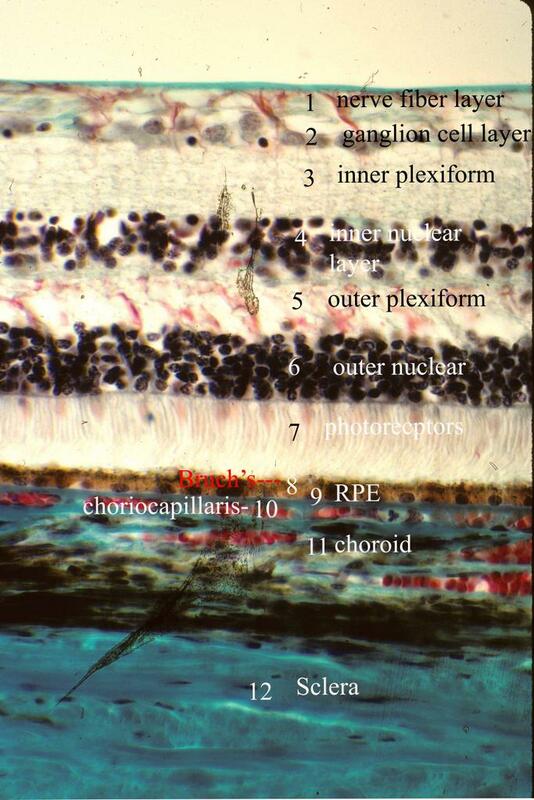 The blood supply of the inner retina comes from the central retinal artery and the outer retina (photoreceptors are supplied by the choriocapillaris #10). Retinal capillaries, which form a dense multilayered plexus thins to one layer peripherally. Retinal capillaries have tight junctions between their constituent endothelial cells to prevent diffusion of substances into the neural retina. Name the areas of the retina at the numbers. Click on the photo to enlarge or right click to open a new window. Check your answers by opening this link. 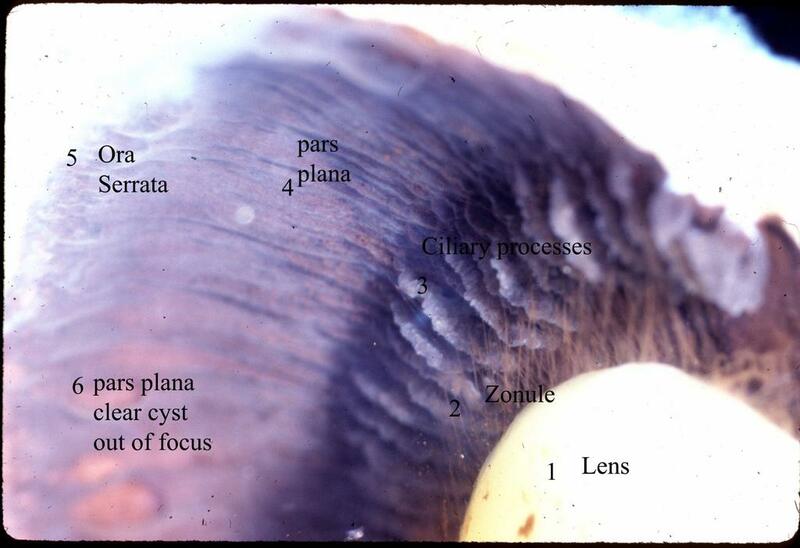 General features and boundaries of the ciliary body. The ciliary body is shaped like a triangle with the base at the iris root anteriorly and its apex at the ora serrata posteriorly. What is the pars plicata? The pars plicata contains about 70 ciliary processes, which are ridges or folds 2 mm long, each with a core of stroma and blood vessels and covered by two layers of columnar epithelium. What is the pars plana? The pars plana is a posterior flat area 4 mm long. 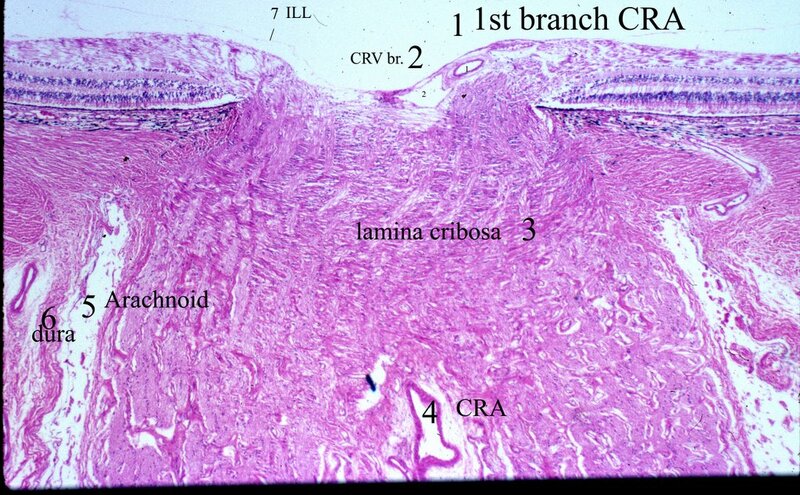 Its stroma is continuous with the choroid, whereas the outer pigmented epithelium of the ciliary body is continuous with that of the retina at the ora serrata. What is the internal lining of the ciliary body? The ciliary body faces the anterior chamber, posterior chamber, and vitreous cavity and is lined by two neuroepithelial layers, a non-pigmented layer internally and a pigmented layer externally. 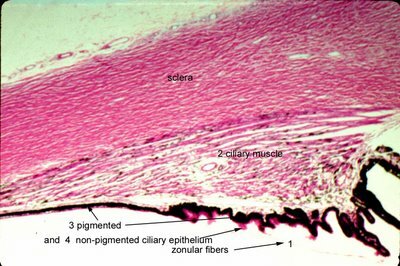 The outer layer of epithelium is pigmented, but the inner layer, which is in contact with the aqueous is non-pigmented. The ultrastructural features of these non-pigmented cells are those of ion-pumping cells; they secrete the aqueous. What is the structure and function of ciliary muscle? Beneath the epithelium are ciliary muscles, smooth muscles. 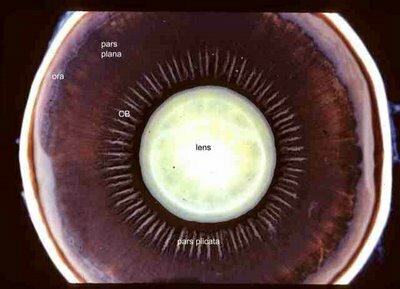 Contraction of the ciliary muscle lessens tension on the suspensory fibers of the lens and allows the lens to assume a more spherical shape, enhancing the power of the lens during accomodation. The lens also moves anteriorly during this action, which also aids accomodation. 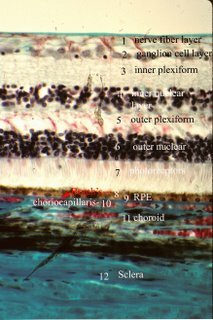 The types of ciliary muscle are important for the resident in ophthalmology. There are actually 3 distinct anatomic types of ciliary muscle, longitudinal fibers, radial fibers and circular fibers. The architecture of the fibers have some general principles. All 3 are attached anteriorly at the ciliary tendon (scleral spur and surrounding soft tissue) as Y shaped extensions with the Y inserting anteriorly into the tendon. The longitudinal fibers merge posteriorly and join the sclera as star shaped attachments referred to as episcleral stars. The middle layer or radial fibers run obliquely to merge and attach to the ciliary processes. 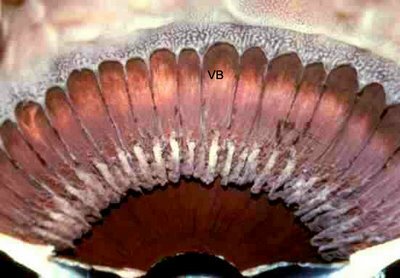 The fibers of the inner circular layer have very wide Y shaped insertions to relatively distant parts of the ciliary tendon and additional anterior fiber attachments to the iris. These fibers then attach to the sclera but more anteriorly than the longitudinal muscle. The obtuse Y angle of the circular muscle and short distance extending posteriorly to the sclera permit the fibers to run in a largely circular direction. 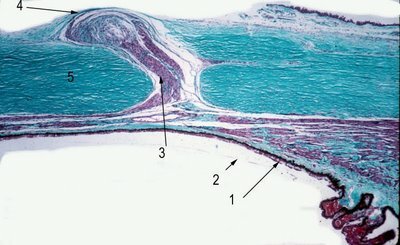 The variation in the type of ciliary muscle that is torn distinguishes traumatic angle recession from cyclodialysis (see link). Click on the photo or right click for higher magnification. 1- A faint zonular fiber is seen traversing along the ciliary process posteriorly toward its insertion in the pars plana. 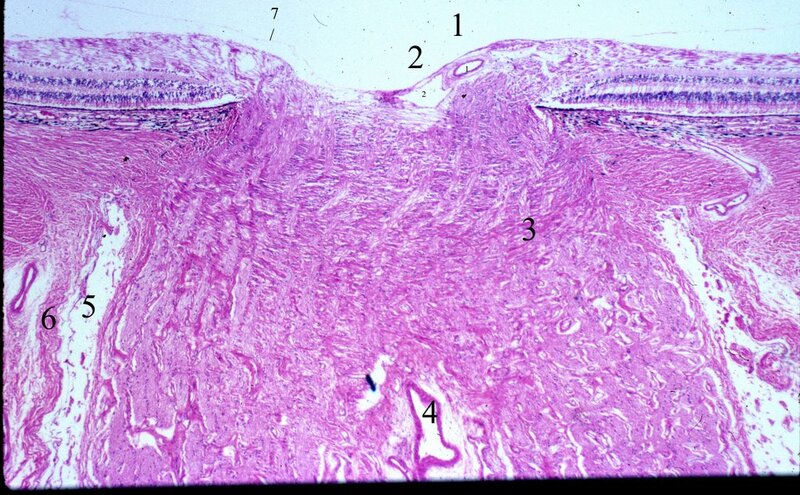 The histologic sections of ciliary muscle show pink smooth muscle bundles (number 2); some are longitudinally oriented toward the scleral side and others are more circular toward the vitreous. The ciliary muscle is responsible for accommodation. 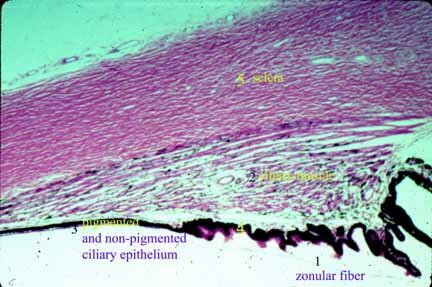 The ciliary epithelium is composed of the inner non-pigmented layer (barely visible here at arrow 4) and outer pigmented layer (arrows 3) . The aqueous is made by the non-pigmented epithelium. The beginning of the pars plicata shows the undulations in the ciliary epithelium. Sclera as marked forms the outer tunic. What is the blood vessel in the center of the ciliary body called? Also seen in this photograph is the prominent central blood vessel in the ciliary body (just to the left of #2 label for ciliary muscle). This is part of the vascular system that is the major arterial circle, which of course supplies the iris. 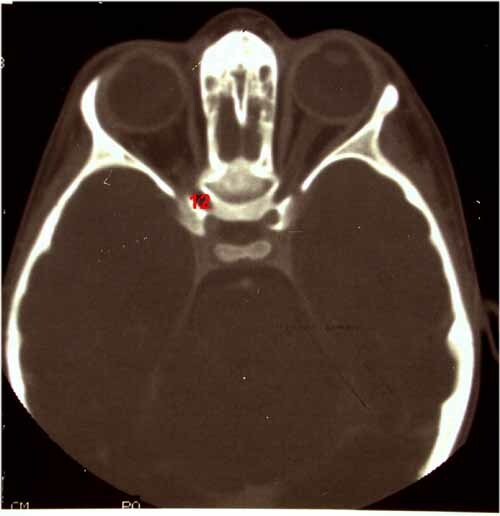 Tears in this vessel is frequently the culprit in traumatic hyphema. 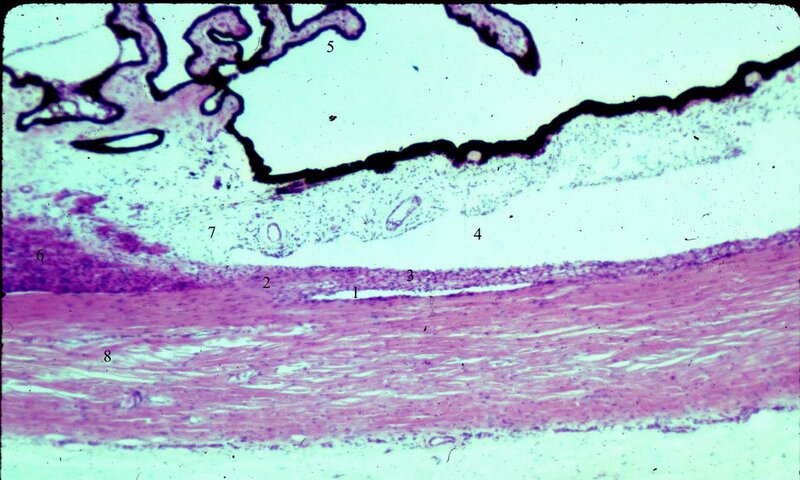 Its position near the border of the longitudinal ciliary muscle explains the predisposition to traumatic injury in acute angle recession. The circular of the ciliary body and iris is complex and involves 3 anastomotic circles. What is Axenfeld's nerve loop? The intrascleral ciliary nerve loop of Axenfeld is an extension of the posterior ciliary nerve, which makes a loop (arrow 3) through the sclera (arrow 5) in the region of the anterior ciliary arteries or between the rectus muscle insertions. 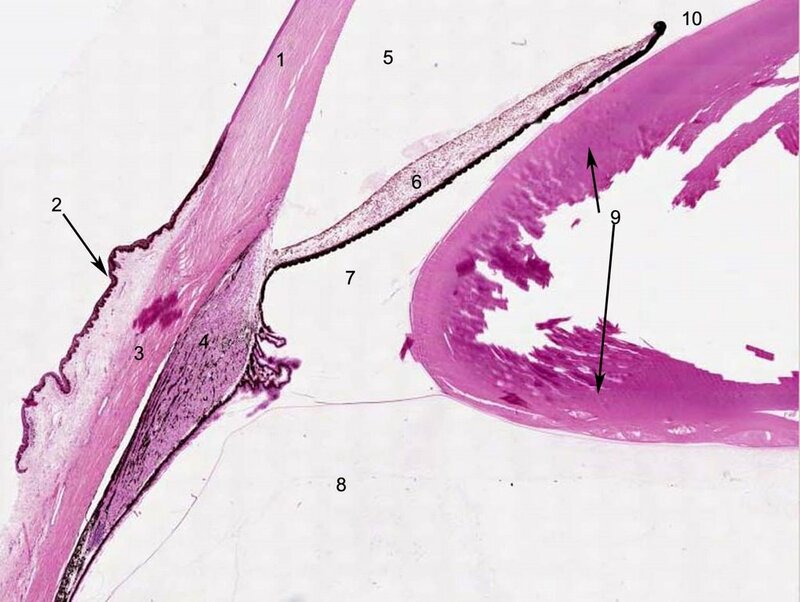 In the figure below the nerve is posterior to the junction of the ciliary muscle at the pars plana. The ciliary epithelium is evident (arrow 1) and so are the lens zonular fibers (arrow 2) as they sweep back along the pars plana. The nerve loop is smooth and dome shaped measuring 1-2 mm in size. The loop may appear cystic and or pigmented leading to a surgical misadventure. The loops are present in about 12% of human eyes. Virtually all are associated with blood vessels and all are pigmented. The loop may protrude to cause symptoms but most importantly, Axenfeld's nerve loop is in the differential of a fixed pigmented epibulbar lesion. It is frequently misdiagnosed as a nevus or melanoma. Manipulation of the lesion elicits pain from the subject as the nerve is present at the external surface (arrow 4). This is the sign that should make one reconsider biopsy! 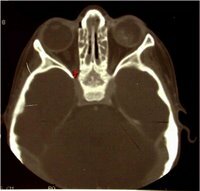 Infrequently, the nerve loops may be multiple in the same eye (0.5%) or bilateral (1%) . For other photographs and additional information about the topography of Axenfeld's nerve loop click this link. Identify the numbered structures. To see the number better click on photo or right click to get a larger image. To check your answers click on this link. 1. Click to enlarge the image and try to identify all of the numbered areas. 2. What is the anatomic determinant of eye color? Why are some eyes blue and others brown? 3. What controls the pupillary aperature? 4. What is the composition of the posterior epithelium of the iris? 5. Where are the nuclei for the dilator muscle? 6. 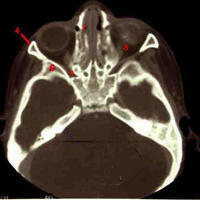 What do you predict are most common tumors of the iris? Then click on the link for the answers. What are the boundaries and layers of the iris? The iris, a component of the uveal tract, delineates the anterior and posterior chambers of the eye. The iris contains pigmented cells and muscle and is composed of four layers: the anterior border layer, the stroma, the dilator muscle layer and the posterior epithelium. 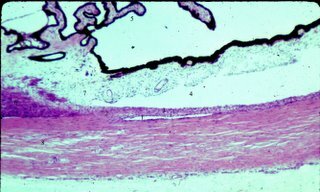 The anterior border layer consists of a dense packing of pigmented or nonpigmented cells similar in appearance to the cells present throughout the remainder of the stroma. Absence of cells produces the so called crypts in the border layer. The iris stroma is a loose fibrocollagenous tissue composed of spindle shaped fibroblasts (stromal cells), blood vessels, nerves and macrophages (clump cells of Koganei) containing phagocytosed melanin pigment. At the pupillary margin is the circumferentially arranged smooth muscle of the sphincter muscle of the iris. What is the blood supply to the iris? The iris is supplied from the major arterial circle that is located in the ciliary body. 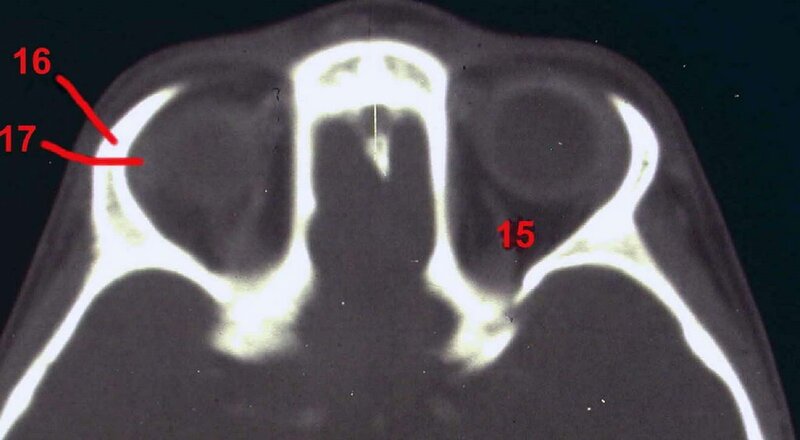 Rupture of this vessel with ciliary muscle tears is frequently the injury that causes hyphemas. 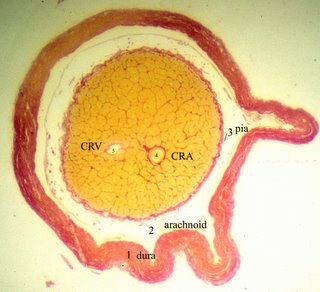 The blood vessels of the iris run in a radial direction. The anterior border layer contains very few vessels. Vessels on the surface of the border layer are abnormal and suggest ischemia in the eye such as in diabetic retinopathy, branch vein occlusions, and neoplasms. Iris blood vessels appeared sheathed and have a characteristic loose appearance. They are nonfenestrated and have pericytes. What is the composition of the posterior epithelium of the iris? 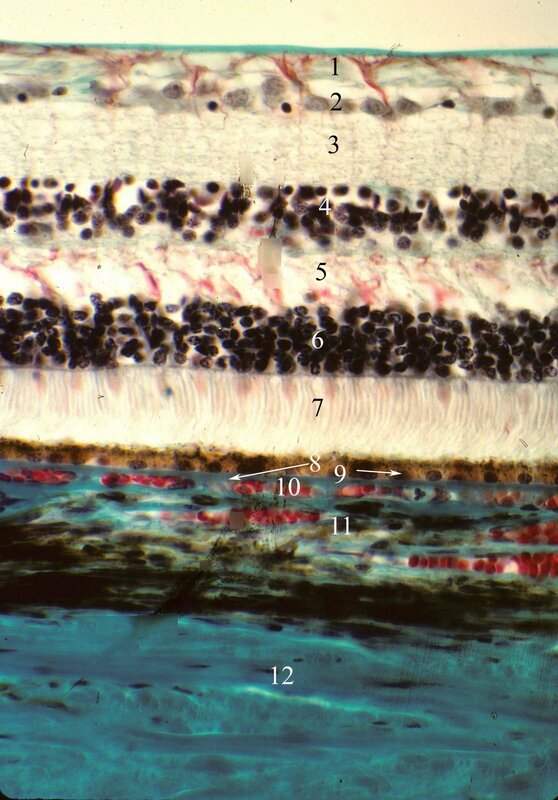 The posterior epithelium is composed of two layers of cells which are densely pigmented with melanin. The posterior boundary of the iris stroma, peripheral to the sphincter muscle, is demarcated by another sheet of smooth muscle, the dilator muscle. 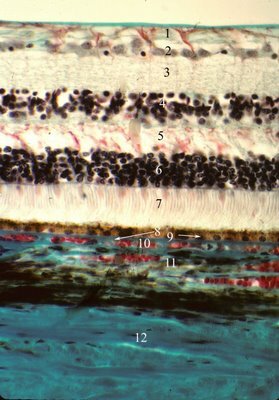 The fibers of the dilator muscle are derived from, and remain in continuity with, the cuboidal pigmented cell bodies which make up the anterior layer of iris pigment epithelium. What determines individual eye color? Eye color is determined by the relative number of melanocytes in the stroma and of course the density of melanin granules produced. Few cells give a blue color, whereas many melanin- containing cells produce a dark brown color; gray and green are the intermediate colors. It has a circular aperture (pupil) that can be opened and closed by the action of groups of smooth muscle. Contraction of the pupil reduces the amount of light entering the eye and thereby reduces the glare from light scattered from the periphery of the lens. The dilator muscle layer is composed of the contractile processes of the myoepithelial cells of the inner layer of the posterior epithelium; it extends from the base of the iris to the sphincter muscle. How does one recognize the vitreous base? As shown in the photograph above- the vitreous base is pigmented. 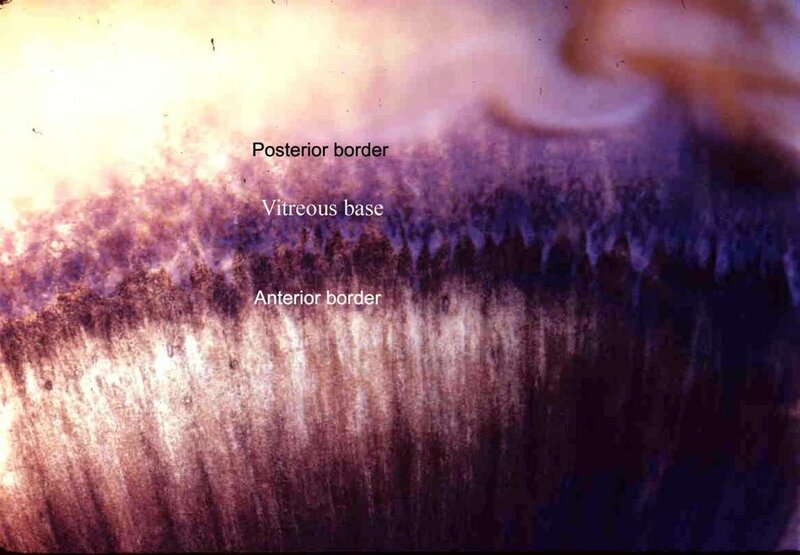 The gross-dark pigmentation begins on the anterior border of the vitreous base (VB). Where is the ora serrata located in relation to the vitreous base? The vitreous base straddles the ora serrata. Notice that the ora serrata is scalloped, a feature that is usually predominant nasally. Where is the vitreous base wider, temporally or nasally? The ora serrata extends more posteriorly on the temporal side but the vitreous base is actually wider nasally. The scalloped margin of the ora is more prominent nasally. Note the typical cystoid degeneration posterior to the ora serrata. 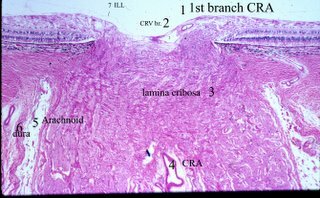 What is the histologic correlate of vitreous base pigmentation? 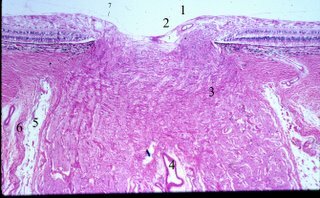 Above- Pigment epithelial hyperplasia accounts for the pigmentation of the vitreous base. The ora serrata is shown to the left marked by cystoid changes (typical cystoid degeneration). Below- transillumination highlights the pigmentation of the vitreous base and its anterior and posterior borders as it straddles the ora serrata. This photograph was taken temporally where the ora serrata is less scalloped. What is the volume of the vitreous? The vitreous cavity is simply an expanded extracellular space that normally contains 4.0 ml of clear gelatinous substance that is composed largely of water, hyaluronic acid, and collagen. The vitreous normally contains anteroposterior oriented collagen fibrils and occasional macrophages or hyalocytes. The presence of even small numbers of acute or chronic inflammatory cells within the vitreous is distinctly abnormal. 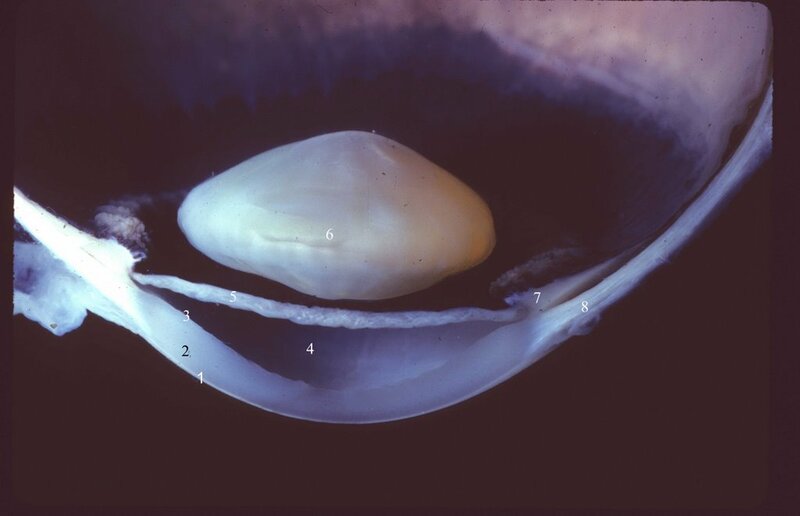 The vitreous has distinct attachments to ocular structures. It is attached most firmly anteriorly in a circumferential band extending from the posterior pars plana to a few millimeters behind the ora serrata in what has been termed the vitreous base. What is the approximate width of the vitreous base? The vitreous base is usually 4-5 mm in width. Traction exerted by the vitreous body at the base results in hyperpigmentation of the underlying pigment epithelium and is evident grossly above. The vitreous is also attached to the retina over retinal blood vessels and at the optic disc. These attachments are important to understanding vitreous traction, retinal tears, and retinal detachment, for which vitrectomies are sometimes performed. 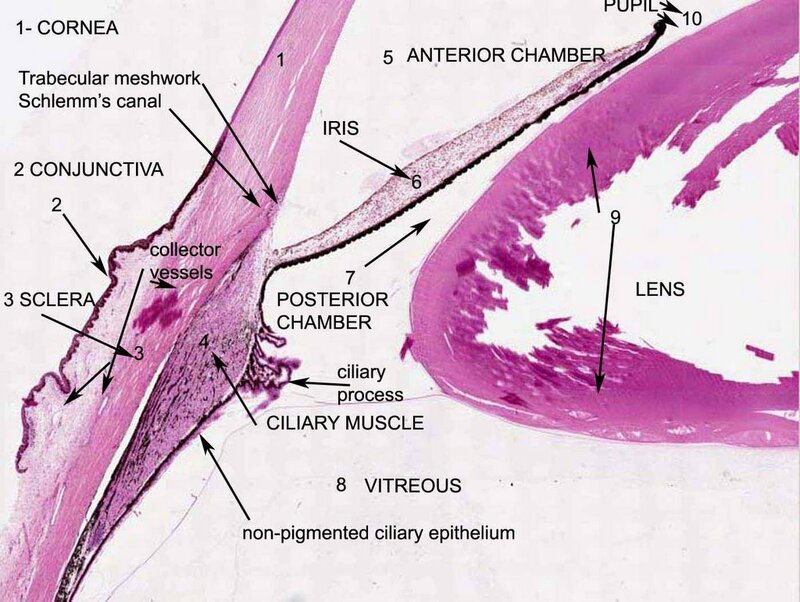 The photo below is convenient to study the flow of aqueous from the ciliary epithelium of the ciliary body through the posterior chamber and the narrow space between the iris and lens into the anterior chamber and then in the anterior chamber angle and trabecular meshwork, Schlemm's canal and the collector vessels. Anatomic pertubations that may obstruct this flow include apposition of peripheral iris against the cornea (known as angle closure glaucoma), apposition of the iris against the lens because of rotation of the ciliary body leading to (malignant glaucoma), obstruction of the trabecular meshwork (such as in hemorrhage known as ghost cell glaucoma), adherence of the pupillary margin of the iris to the lens as after severe inflammation), and back pressure on the system such as a tumor that obstructs aqueous veins or a carotid cavernous sinus fistula that produces elevation of venous pressure and blood can sometimes be seen in aqueous veins.